World market leader in high-pressure cleaners. Kärcher high-pressure cleaners fulfill every demand and are used in the widest variety of fields. In agriculture, crafts and trades, industry, or municipalities – we are in our element wherever large areas must be cleaned daily. Clean machines, vehicles and buildings daily with high pressure and a high flow rate. Cold water high-pressure cleaners remove even stubborn dirt and are Ideal for large areas. High pressure cleaners clean even better with hot water at the same amount of pressure. Kärcher machines are convenient to use, and feature state-of-the-art technology. Wet and dry vacuum cleaners – all-purpose allrounders. Indispensible: wet and dry vacuum cleaners can take on all types of dirt regardless of whether it is indoors or outdoors, dry, damp, or liquid. NT Series Wet and Dry vacuum cleaners. 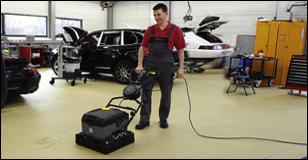 Industrial vacuum cleaners – equipped for every application. High suction power for all your industrial cleaning needs: With the properly equipped Kärcher wet and dry vacuum cleaner, you can vacuum fluids and combustible dust on industrial premises. Kärcher upright carpet vacuums combine high suction power with an electrically driven brush. This is the ideal way to remove stubborn dirt particles from carpet fibres. 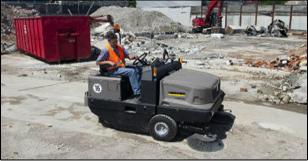 Ride-on vacuum sweepers – professionals on every surface. Economical, clean and efficient on medium-sized and large surfaces: The diverse variants of Kärcher ride-on vacuum sweepers allow them to meet every demand. Compact scrubber dryers – small and powerful. Easy to move and simple to use: these scrubber dryers are ideal for use on medium and large hard surfaces: for brilliant results.